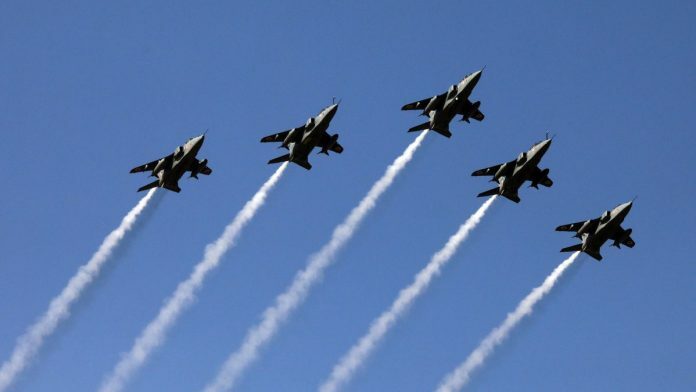 The Indian Air Force struck at Jaish-e-Mohammed’s ‘biggest’ terrorist training camp at Balakot in Khyber Pakhtunkhwa province in Pakistan early Tuesday. 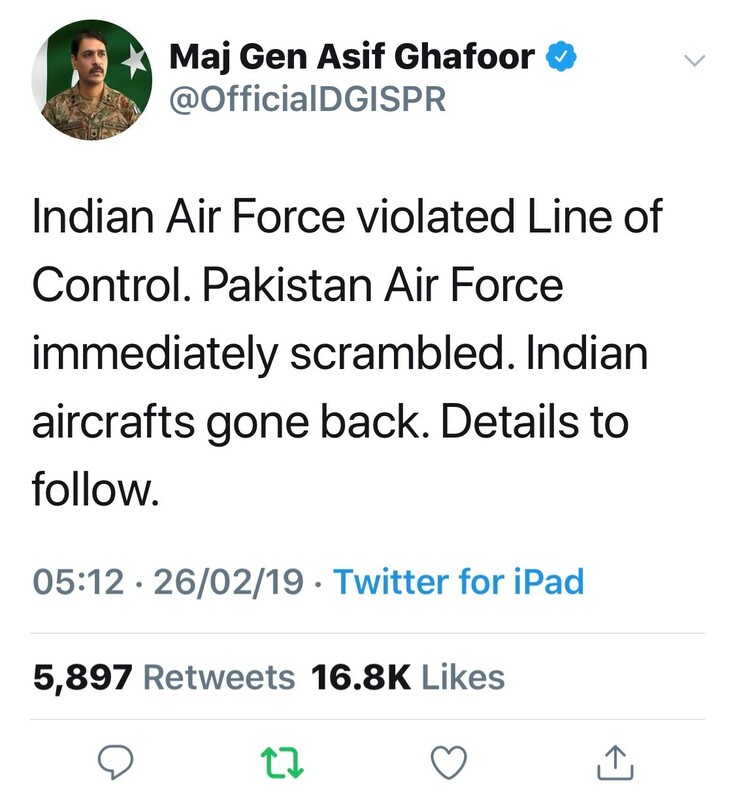 Pakistan’s Director General-Inter Service Public Relations, Major General Asif Ghafoor, was the first to break the news on Twitter and followed it up with some more information later. As per speculative reports, terrorist training camps at Muzaffarabad and Chakoti were also attacked. It is not clear whether the Indian aircraft crossed the Line of Control (LOC) or whether this was a ‘standoff’ attack from our side. The IAF has the capability to launch standoff attacks at ranges of 100-150 kilometres. As per various sources, 12 Mirage 2000 aircraft were used in the strikes. A meeting of the Cabinet Committee on Security was held Tuesday morning. Foreign Secretary Vijay Gokhale formally confirmed that a “preemptive air strike” had been launched at the JeM terrorist training camp in Balakot. He highlighted that it was a “non-military” intervention to preempt further terrorist attacks by the JeM about which there was credible intelligence. Gokhale stated that the strike only focused on the JeM camp at Balakot run by Yusuf Azhar, the brother-in-law of JeM chief Masood Azhar. Substantial casualties have been caused to the leaders of these terrorist camps and significant infrastructure has been destroyed. Gokhale asked Pakistan to adhere to its commitment made in January 2004 to prevent its territory from being used to launch terrorist attacks on India. Damage assessment has not yet been given by the IAF. Given the nature of the layout of the terrorist training camps, the import of the air strikes is not in the number of casualties caused or the number of buildings/huts flattened, but in the symbolism of the message — a warning to Pakistan or a bait to make it retaliate to precipitate the situation in order to punish it. How is Pakistan likely to respond? How will the situation unfold? After the ‘one-off’ surgical strike following the Uri attack in September 2016, which while being a tactical success produced no strategic results, it is logical to assume that this time the strategy is holistic to force compellence on Pakistan. This implies that India is prepared to go up the escalatory ladder all the way to a limited war. In fact, as per our proactive strategy, the air strikes can be launched in 24 hours and the first ground action can begin in 48 hours from the time a decision has been made. These actions then continue to progress reaching the full spectrum in 10 days’ time — 12 days would have given us the time for full spectrum conventional operations. Alternatively, to maintain surprise, we could still exploit the progressive action. The ball is now squarely in Pakistan’s court. It can opt for denial as it did after the surgical strikes or it can respond militarily in a manner it deems fit. While we can morally justify the strike on a terrorist camp, Pakistan will call it a facade and justify its retaliation by terming the IAF strikes a violation of its sovereignty. My assessment is that Pakistan will respond militarily. It has the capability to exercise all the military options as highlighted by me in my last column. “Alea iacta est – the die has been cast” — Julius Caesar had said in a Shakespeare play on crossing the Rubicon. India has used its air power in Pakistan for the first time since 1971. We can only wait for the situation to unfold.